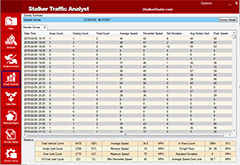 Collect and analyze traffic statistics, then generate reports for Grant applications and community policing from Stalker Radar. The analysis window is the visual heart of the program. The floating palettes control the visual display and survey details may be added such as Google Map/satellite views, descriptions, and notes. The Analysis Control palette where the analysis type is chosen and then applied to the analysis window. 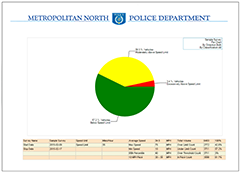 A simple tool for Law Enforcement, citizens, city council, and management. Quickly display vehicle speeds below, moderately above, and excessively above speed limit threshold. 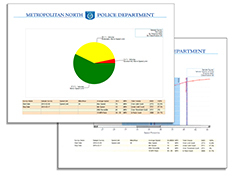 The Graph Controls palette provides additional options such as grid detail, data values, display type (graph or tabular) and graph type. 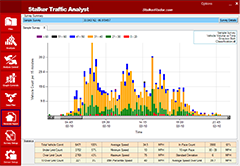 Fine tune the data by more selective parameters such speed, dates, times, classification, and traffic direction. Simple setup allows for custom design of your reports with Agency information, branding, photos, and other supporting details for printing and distribution. 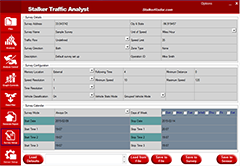 Communication between the Traffic Analyst program and the Stalker Traffic Statistics sensor is simple and virtually automatic.